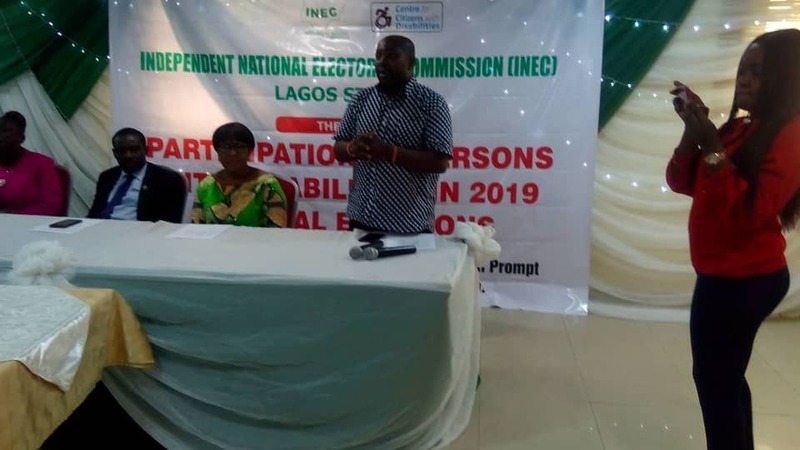 On Wednesday 23rd January 2019, Centre for Citizens with Disabilities (CCD) in collaboration with the Independent National Electoral Commission (INEC) organized a sensitization forum for people with disabilities (PWDs) as part of the Independent National Electoral Commission (INEC) policy for the inclusiveness of persons with disabilities in the electoral process, and their participation in the 2019 general elections. The first presentation was done by Mrs. Olarenwaju, the Executive Director of Disability Policy Advocacy Initiative (DPAI). The second presentation was presented by Buba Luka the PWD Desk Officer INEC Lagos state. Other people present were: Bar. Kola Ogunbiyi Senior Program Officer Centre for Citizens with Disabilities (CCD), Mr. Oguntoye Director Monitoring and Evaluation, Lagos State Office for Disability Affairs (LASODA). And representatives of Organizations of Persons with Disabilities (OPDs), JONAPWD and the Media. Mr. Peter Ekemini Assistant Program Officer CCD moderated the event.